Howard’s last word on education. John Howard has, in my opinion, been guilty of saying some very stupid things over his time in public life, but nothing comes close to the howler on last night’s 7.30 Report. Thanks for that John. Care to explain how that fits in with the narrative history of Australia that you’re so keen be taught? Update: The other corker from Howard that had me choking on my chardonnay (or is it latte these days? I can never quite keep up with the lefty beverage du jour) was this. Words fail me on that one. Long time fan, firtst time commentor. 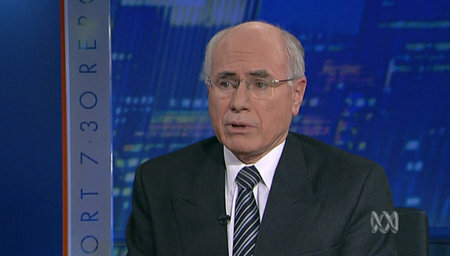 I love the tag “7.30 report, John Howard, Idiot”. He said that what we really need in education is a restoration of basic standards. “Before anything else, we need to produce children out of schools who can read and write and spell and add up. We also need to overturn that terrible mistake that was made 30 years ago when we abandoned specific technical colleges or technical schools. ‘Restore’, ‘bring back’ and ‘restore’ again. Quite the revolution – Let’s get education standards back to the the 1970’s. Perhaps what he meant was that you can’t learn by reading a book; you need a piece of slate. Yesterday’s man will soon be part of that “proper narrative of Australian history” only it won’t be “The history of Australia according to John Howard”. He’ll simply be remembered as a lucky little man of no great substance who unexpectedly became Prime Minister and somehow managed to keep the job for over 11 years, the second longest serving leader in our “history”. Amen. To be fair Lee, last night with Kerry he did say that he was ‘being ironic’ when he used the phrase education revolution during the debate. It seems that Mr Howard can take a seat next to Alanis Morissette in remedial English. So what he is saying is that we don’t need a revolution at all, just a regression? He can say all he wants about education now. I’m glad I won’t have his government looking over my shoulder while I’m trying to teach. oh take a look ath him he’s yesterday’s zero, yesterday’s weirdo.